These tools are also called API simulation, API mocking, API mocks, over the wire test double and stubs. They are the next generation of tools  that allow for testing you components in isolation and support Continuous Delivery, Continuous Integration, DevOps and Agile as first-class citizens. They are designed for decentralized, autonomous, cross-functional or product teams. Other enterprise offerings See below "Why do our customers choose Traffic Parrot over other enterprise offerings?" We are comparing here only the next generation service virtualization tools, and not including the early generation ones. Traffic Parrot HTTP(S) component is built on top of open source WireMock. Keep in mind that Traffic Parrot supports more use cases than WireMock such as more extensions for dynamic responses and proxying HTTPS traffic via a HTTP proxy (HTTPS tunneling). FIX, FAST, FIXatdl, SWIFT, AMQP, MQTT, RabbitMQ, SonicMQ, Kafka, CORBA, FTP, SFTP, .NET WCF, RMI, MTP, TIBCO EMS, CICS, SAP RFC, JDBC, Mongo, Databases, OFX, IFX, RIXML, AS2, Amazon Simple Queue Service (SQS), Amazon Simple Notification Service (SNS), AWS IoT Message Broker, XMPP, Google Cloud Messaging (GCM), Azure Event Grid, Azure Event Hubs, Azure Service Bus, STOMP, Thrift and Avro. Other features and protocols available on request. Why do our customers choose Traffic Parrot over other enterprise offerings? Our team has a vast experience with different tools available on the market. It makes Traffic Parrot stand out form the other commercial offerings and work well in microservice-like architectures developed by decentralized, autonomous or cross-functional teams. Designed for autonomous, decentralized, cross-functional or product teams. It will allow you to avoid a centralized admin team that could be a bottleneck for the teams when creating API mocks and virtual services. One simple but powerful component with a small footprint (less than 50MB of disk space) allowing you for more flexibility. Can be run on your Laptop/Desktop, CI server, Docker/Kubernetes, Cloud or VM. This allows for implementing Service Virtualization As Code (API Mocking As Code) and Sidecar Service Virtualization Pattern which are the industry standards when working on microservcie architectures. A licensing model and cost plan that fits Continuous Integration and DevOps practices. Different ways of creating virtual services like manual request/response import and record and playback. A visual interface where you could customize more complex workflows. Instead, you write custom plugins/extensions yourself in Java or ask us to write custom plugins/extensions for you. It can be run on your Desktop/Laptop, VM, Docker/Kubernetes and the cloud. You can run Traffic Parrot in Jenkins, TeamCity, Bamboo, and CircleCi. 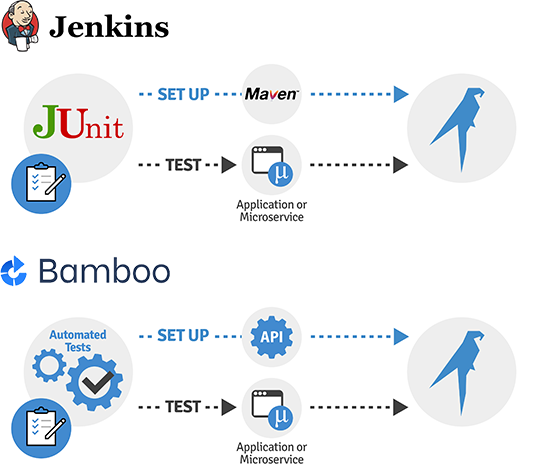 You do it by configuring it via a Maven plugin or using REST APIs. The business justification (quoting Wikipedia): "Infrastructure automation enables speed through faster execution when configuring your infrastructure and aims at providing visibility to help other teams across the enterprise work quickly and more efficiently. Automation removes the risk associated with human error, like manual misconfiguration; removing this can decrease downtime and increase reliability. These outcomes and attributes help the enterprise move towards implementing a culture of DevOps". Traffic Parrot has first-class support for the sidecar Sidecar Service Virtualization Pattern (Sidecar API Mocks Pattern). We recommend running your API mocks in the same process as your tests (and using Service Virtualization As Code - API Mocking As Code). If you decide to run your API mocks or virtual services in a separate process though, run them in a docker container. This way you are taking your automation to the next level, you have a fully automated and reproducible build pipeline. Running in a container like Docker also means you are doing Infrastructure as code with all of its benefits to your business. Traffic Parrot can be deployed in a decentralised as well as a centralised model. The decentralised deployment model is designed for teams working with microservice architectures. As Martin Fowler observed, when working with microservices it is typical that "the (microservice) teams are cross-functional, including the full range of skills required for the development: user-experience, database, and project management." The full range of skills will also involve API mocking and service virtualizaiton. In such environments, every team will one or more team members that are capable of doing service virtualizaiton or API mocking on their own without having to rely on a centralised team of administrators. For the team to be fully autonomous, they will need flexibility when and how to run their virtual services and API mocks. Traffic Parrot can be deployed on a Laptop/Desktop, CI server, Docker/Kubernetes, Cloud or VM; hence it is possible for the team to be fully autonomous by having their instances of Traffic Parrot. Traffic Parrot HTTP(S) module is based on open source Wiremock. If you use only the HTTP(S) module in Traffic Parrot, it is possible to use Wiremock where possible, and Traffic Parrot only in cases where Wiremock is lacking functionality. This way you get less vendor lock-in. ThoughtWorks observed in July 2014 that "The gap between what 'enterprise-class' commercial packages provide and what is actually needed is widening. This is especially true for internet facing applications. Innovative solutions that really scale and easily support modern techniques such as continuous delivery are written by practitioners for practitioners. They originate with many internet scale companies and are refined as open source software. Big enterprise solutions often obstruct effective delivery due to their accumulated bloat, cumbersome licensing restrictions, and feature sets that are driven by check-lists and imaginary requirements far removed from the realities of most development teams.". This means there is less risk in choosing a tool that is building on top of open source technology and one that follows practices established in the open source community. Should you build your tools in-house? There are many service virtualization tools available either as open source distributions, commercially available off-the-shelf software (COTS), or SaaS offerings. Our customers find it as difficult to attract and retain development talent as any firm operating in today's competitive environment and choose to pay for Traffic Parrot to get guaranteed support and avoid spending internal development time and energy on what would essentially be re-inventing the wheel. They focus their talents on additions to their core offering that increase the value to their end customers. How is Traffic Parrot different to WireMock? WireMock is a great tool, we recommend it on many occasions. Traffic Parrot HTTP(S) component is build on top of WireMock. let’s schedule a 20 minute call to explore if Traffic Parrot is a better fit for your needs. We allow you to generate dynamic responses based on data fromn the SOAP or REST JSON requests. Have a look at the SOAP example video. While testing mobile applications you might want to define a HTTP proxy in Android or iOS Genymotion simulator or your real device. When your application connects to the backend systems via HTTPS Traffic Parrot will act as a man in the middle HTTPS proxy without your application even noticing that it is being ticked. WireMock supports only HTTP, not HTTPS. Graphical User Interface, ideal for quick and easy manual exploratory testing. Predefined extensions (dynamic responses, pass-through mode, use request data in responses, record only specified content types, etc.) for advanced service virtualization of large-scale or legacy systems. Easy management for HTTPS certificates. We listen to our customers and add new features on a weekly basis. Have many additional extensions available as well things like Passthrough Mode, Recording filtering by content type, and many more. 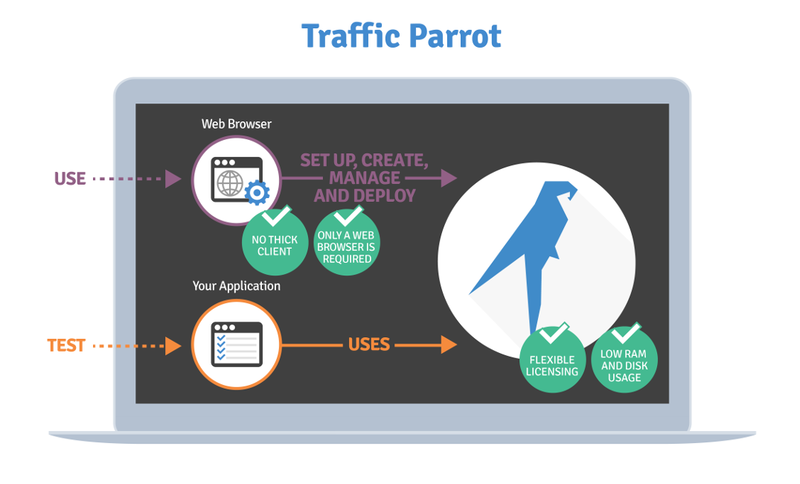 Traffic Parrot is designed for both testers and developers. Majority of open source service virtualization software (like WireMock) is written by developers for developers. It is great for developers, but testers get left behind. The way we are different to most open source is that our tool is designed with both developers and testers in mind. We have programmable APIs for developers and an intuitive user interface for testers to use. We provide first class support to both testers and developers. We value collaboration and make sharing virtual services between developers and testers easy, which can be costly to implement just with open source. Often developers are implementing the new best practices and using the cutting edge technology, following the latest trends. Then, often testers get left behind, and have to keep up with developers. Our tool helps to facilitate the communication between development and testing. Find out more in the Continuous Delivery team video. We aim to fix them in a few days to a week. Even if you fix an issue in an open source project codebase yourself and create a pull request, it might take a few weeks to a few months before the new version is released. We aim to release new versions in a few days to a week. How is Traffic Parrot different to Charles Proxy? Charles Proxy is a great tool. There are significant differences between Traffic Parrot and Charles Proxy, though. Traffic Parrot is scriptable and programmable. It is a complete service virtualization and API mocking platform with many extensions available. Traffic Parrot can be run anywhere. On your laptop, on a server, in docker, on a Jenkins/Bamboo/CircleCi/TeamCity agent and on AWS. You can run Traffic Parrot on a server using command line (headless). The GUI is accessed via a web browser. Our tool is designed for manual exploratory testing, automated performance testing and functional testing of large and legacy systems. Its not only a HTTP Proxy aimed at debugging. How is Traffic Parrot different to Mockito? Mockito is a great tool, even we use it internally at Traffic Parrot for in-process mocks. It might not be possible to use Mockito in some situations though.